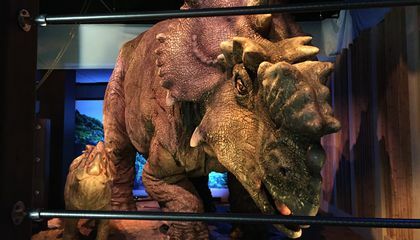 Dinosaurs in museums tend to be of the fossilized variety, but a new exhibit in Philadelphia is bringing the creatures and their world to life. "Jurassic World: The Exhibition" has opened at the Franklin Institute, and it is based on the blockbuster dinosaur movie franchise. The experience mixes the vibe of a theme park with the backstory of science, but the big - like, really big - attraction is the animatronic dinosaurs, some measuring over 24 feet tall. The traveling show made its world premiere in Melbourne, Australia, earlier this year, but Philadelphia's U.S. debut offers some new features, so here's what visitors can expect at the exhibit, which runs through April 23. The museum will feature a dinosaur petting zoo. Guests can meet a towering Brachiosaurus, come face-to-face with a Velociraptor and get up close and personal with a Tyrannosaurus rex. The lifelike, life-size dinosaurs were designed by The Creature Technology Co., which created the enormous creatures for the "Walking with Dinosaurs" arena shows. A family-friendly "Gentle Giants Petting Zoo" also promises interactions with a baby Pachyrhinosaurus and its 29-foot-long mother. Visitors can even "pet" a small dinosaur. What's different from the exhibit in Melbourne? The U.S. debut of the exhibit offers a look inside a raptor training paddock, like the one used by Chris Pratt's character in 2015's "Jurassic World." It includes an interactive raptor. Tom Zaller, president of Imagine Exhibitions, said the U.S. show also adds additional science-related content and interactive elements, and it is nearly double the size of the Australian version. The exhibit is pro paleontologist. Exhibit organizers worked closely with paleontologist Jack Horner, one of the best-known dinosaur researchers in the world, to help get the science right. Horner discovered the world's first dinosaur embryos and found that dinosaurs had nests and cared for their young. In his book "Jurassic Park," Michael Crichton based the character Alan Grant on Horner, and movie maker Steven Spielberg brought Horner on as a technical adviser on all of the "Jurassic Park" films while Horner did it without a college degree and with dyslexia. Fake creatures, real science. The museum hopes to appeal to fans of science in addition to fans of the movie, and an educator guide offers ways to look at the exhibit through scientific eyes on topics including ethics in science, climate change, DNA and genetics, and extinction. It also offers interactive exhibits, and brave visitors can even stick an arm into a pile of dinosaur dung to feel its squishy, warm interior as a way to learn about identifying animals by studying their leavings. How are the creatures fake, but the science real? This is so awesome. Lots of people would love this. This is so freaking cool. The creatures are only statues of the real science that lies behind the figures from the past. 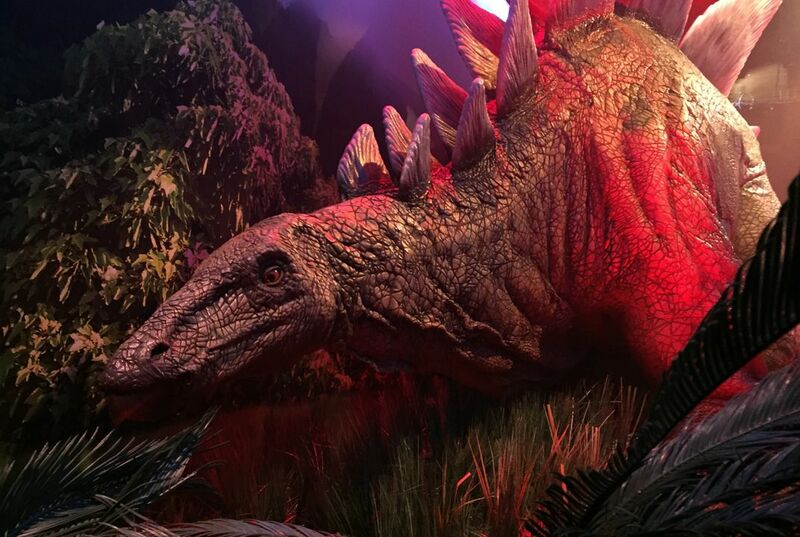 The statues show a better idea of what the dinosaurs actually looked like and also provides science in the exhibit to gain information about the creatures. Some of the animatronic dinosaurs at the new exhibit measure over 24 feet tall. This juristic park feature will run through April 23. There will also be a family friendly petting zoo. I think fans of this movie will really appreciate this and the event will be really popular. The creatures are just statues that is how they are fake. But the science behind the creatures are real they are there for only exhibits. The creatures are metal and robotic but the way in which they function and sound is real. When looking at the creatures you are able to see the real life motion they make and can learn the way the eat and what they eat. the creatures make real life noises and give the students good example of how they once lived.